Two weeks ago The Little Loaf turned six. I failed to mark the occasion here and, if I’m honest, would have forgotten about it completely had I not received a little note from WordPress informing me of the event. I’m not normally one to let anniversaries sail by – I’m the personality type who likes to look at progress, and anyway, who in their right mind turns down an excuse for celebratory cake? – but this season of our lives is just so busy that the superfluous seems to get pushed out of the picture. 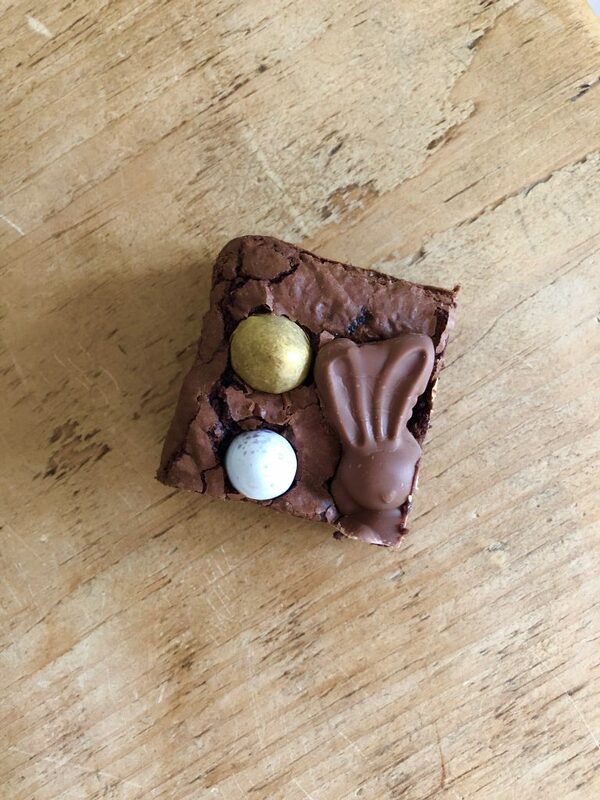 But Easter is almost upon us and baking with chocolate inevitable, so here I am today with a brownie worth celebrating and a seasonal bake to have in the bag all in one. 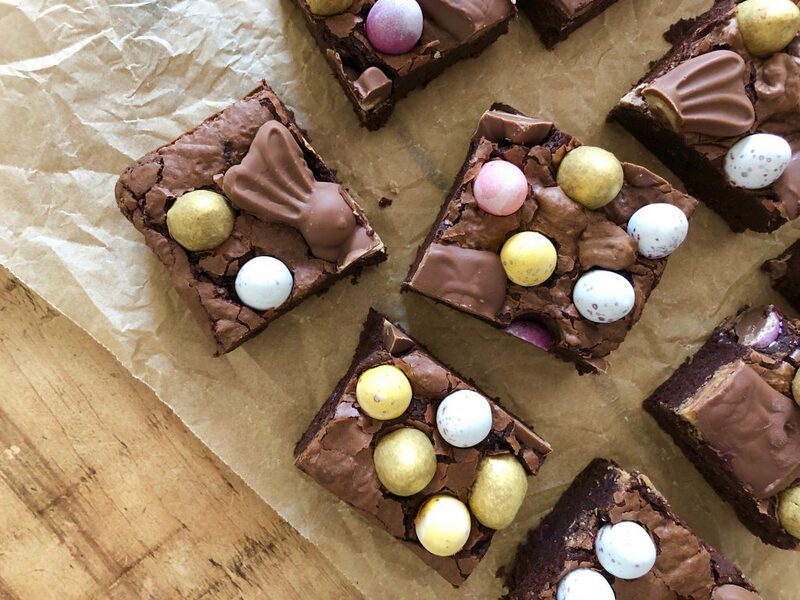 It would also work as a cupboard clear out job after Easter is over for all that ‘leftover chocolate’ recipes always talk about, if leftover chocolate is a thing in your household. It isn’t in ours. Easter is a source of serious excitement to our just-turned-two year old. 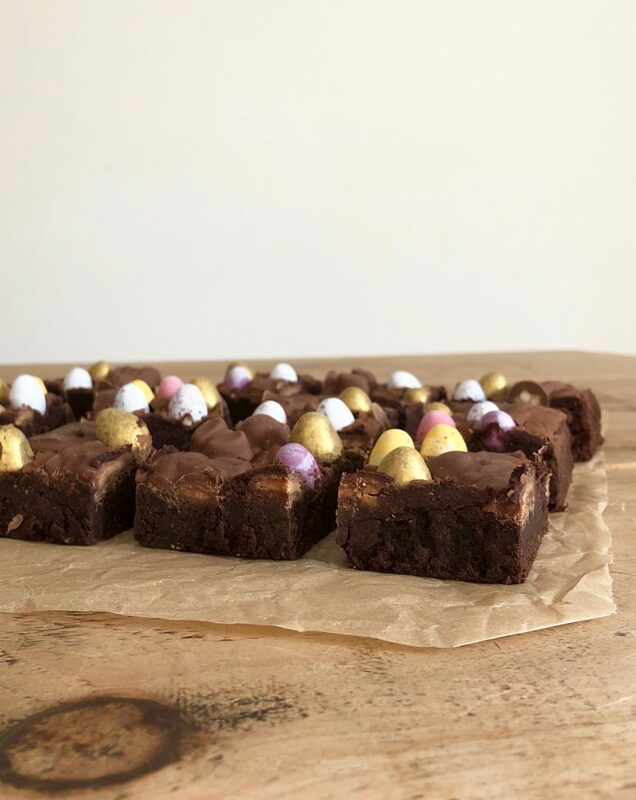 He’s obsessed with eggs – chicken eggs, dinosaur eggs, chocolate eggs – and tells us ‘it’s almost Easter’ several times a day. The source of this excitement is twofold: the promise of an Easter egg hunt at his Nonna’s house (he’s a food loving boy, but I honestly believe the thrill is as much in the hunting as the potential to eat lots of chocolate) and the fact that we’re going to meet Peter Rabbit at Kew Gardens. ‘And feed him carrots and cabbage and lettuce and cuddle him.’ Of course. 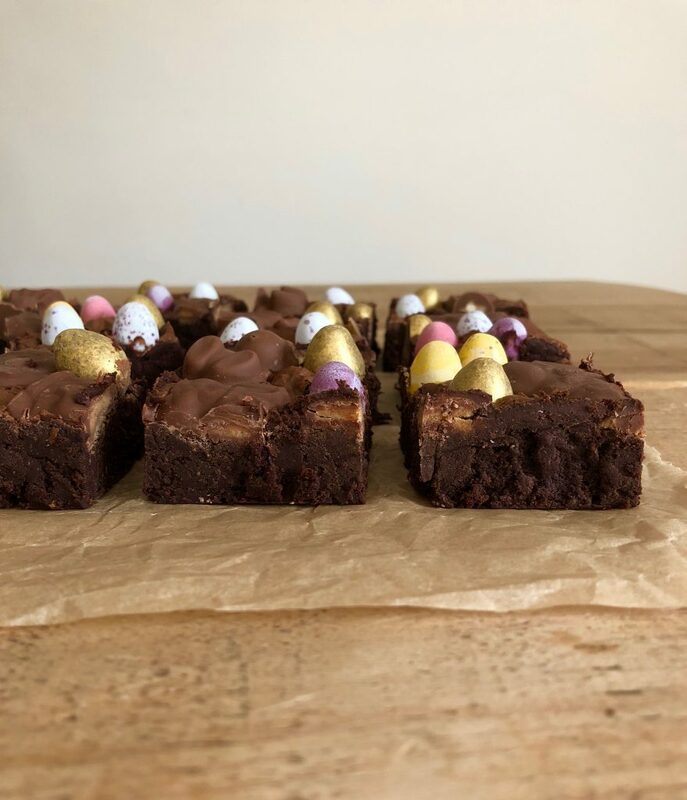 The perfect pre or post Easter treat - rich fudgy brownies topped with ALL the Easter chocolate. Feel free to use your favourite brands or whatever you have to use up from your stash. Preheat the oven to 180 degrees C/160 C fan. Grease a 23cm square baking pan and line with parchment paper. In a heatproof bowl, melt together the butter and the chocolate over a pan of water that’s been brought to a boil and then taken off the heat. Allow the mixture to rest, stirring occasionally as it melts. In a separate bowl, whisk together the cocoa, flour and baking powder. In the bowl of a stand mixer, whisk together the sugars, eggs and vanilla until light and fluffy. Slowly add the melted chooolate, followed by the dry ingredients. Mix just enough to combine then pour into the prepared baking pan. 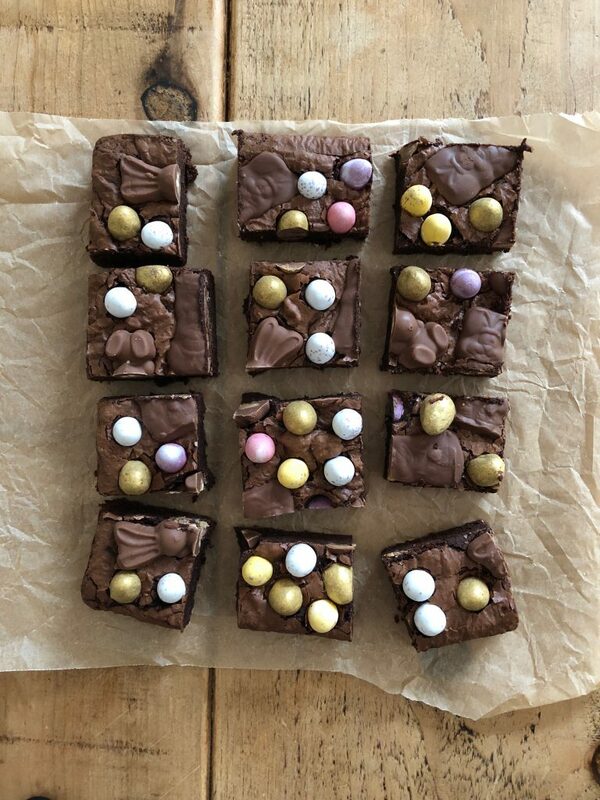 Bake for 20 minutes, or until the brownies are set but with a slight wobble, then remove from the oven and press in the Easter chocolates. Leave to cool completely in the pan before slicing into squares. Amazing recipe. Got many complements on look and taste. Will make this again near Easter.